I attended the Crystal City Council work session and meeting on January 21. The work session had three items on the agenda: Change in liquor license fees, change in pawnbroker fees, and council salaries. The first item was liquor license fees. 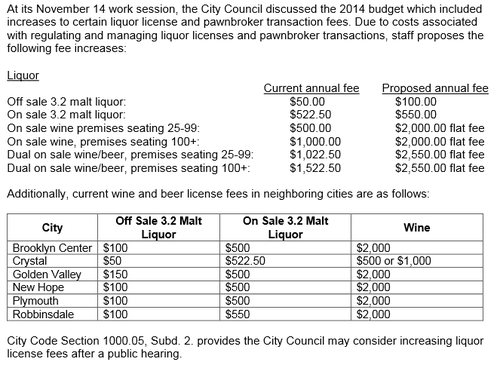 The council discussed a proposed doubling of liquor license fees for 2014. Some fees would go from $1000 to $2000. The justification for the fee increases was threefold: 1) fees have not increased in quite some time 2) Crystal’s fees are lower then its neighbors 3) fees aren’t covering the city’s costs to administer the licenses. There was much discussion about the topic, with the council split. There was no clear consensus as to what to do. A request was made to get a detailed accounting of the city’s costs that would be covered by these fees. I was glad that this request was made, as I don’t feel that “because our neighbors charge more” is a valid reason to double fees. If businesses have really been getting a deal, in that their fees haven’t been covering costs, then that is something that should be looked at. But I would also question whether the process on the city’s side is as efficient as possible. Just because they city can levy fees doesn’t mean they should. I was not clear about what the next step was on this process, but I do know that there will be a public hearing before any action is taken. There was a brief discussion on pawnbroker fees. It seems that these will be raised without much if any opposition. At the end of the meeting the council voted to give members of the city council and the mayor a 1% pay raise for the years of 2015/2016. This is in line with the projected increases for city employees. Council members currently make around $8,100 per year, while the mayor makes about $10,500. The increase adds about $600 to the city’s budget per year. Immediately after the work session was the council meeting. During open forum a woman discussed her concerns with a 55+ walk program offered by the city at the community center. She isn’t 55+ and wants to attend and bring her children. The matter was referred to the Parks board, and the city manager noted that there are plans in place to create a family friendly walk time. The first item on the regular agenda was the approval of the garage variance that was approved at the last planning meeting. Next the city was asked by the city engineer to approve a resolution ordering the construction of an emergency water supply. This is a joint project with the cities of New Hope and Golden Valley, which make up the Joint Water Commission. The city has been discussing the need for the emergency water supply for some time, and this project is being hastened by the issues we had last summer with losing water after large storms hit Golden Valley. I support this project and feel that the price tag seems reasonable. I do have some issues with how this project was ushered through the approval process, but that’s a topic for another post. After that the council went into closed session to discuss offers on several properties the city is trying to acquire to make room for the new public works facility. That’s a project I support in principle, but I am very uncomfortable with the cost. The city is allowed to go into closed session when the topic is negotiations. The meeting is still recorded and the video of the meeting is released after all of the deals are finalized. There was one more item on the agenda, but since I had to leave for the negotiations part, I decided to go home.